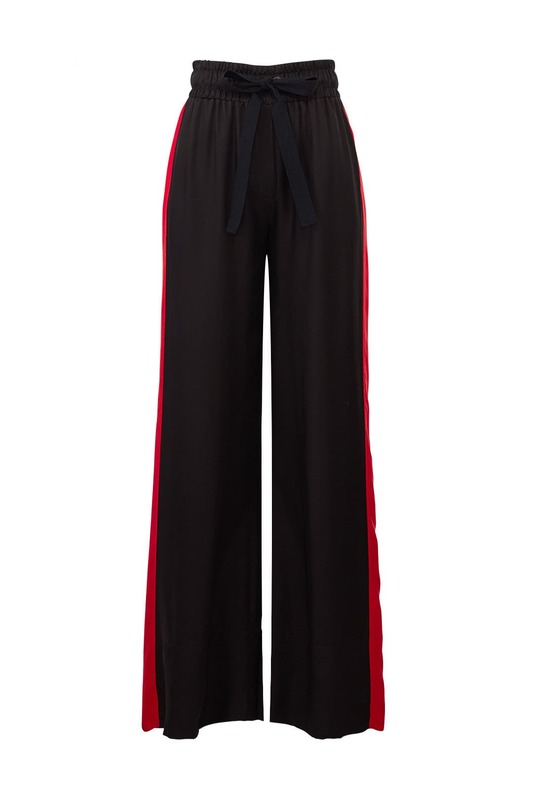 With sporty stripes and billowy legs, these Cinq à Sept drawstring pants are essential for laid back-cool style. Black crepe (100% Cupro). Pants. Drawstring waistband. 40" from waist to hemline; 31" Inseam. Imported. Got compliments left and right. I'm 5'2" so it was long on me, but with heels it was fine. Would rent again! Enjoyed wearing for a day, but wouldn't buy. Length was perfect for a modest block heel, can adjust position on hips, size good. I wear a 30 jean, wanted them loose, XL was generous for a big booty. Material wrinkles badly after sitting, just kinda gotta rock it. Husband said they looked like 90s tear aways but ya, duh. I'm usually a large but sized up. Not sure why. These are comfy and well made but I think they'd be more flattering if I chose a lg which is my usual size. I will wear them with a longer shirt and then send back and maybe try again on the sizing. Very silky and the weight and hang is nice. 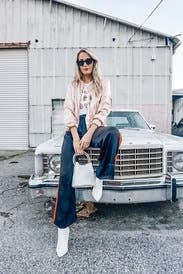 Love these they are super comfy but also chic! I wore them as high as I could and the length just skimmed the floor. I rented these for weekend trip with the hubs to Philly. I got soooo many compliments (and dirty looks) from men and women. 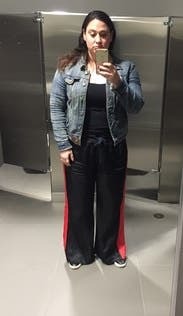 I should mention my husband totally hated these pants. This piece was so versatile. 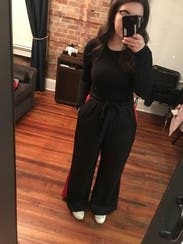 I wore for work, lounging around, walking through the city and for cocktails and dinner. Highly recommend! 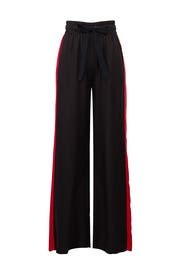 Very flattering with the wide leg. So soft. Love them! Adore these- comfy and soft! Fabric is actually really luxurious and silky - not what I was expecting from the photos. I adored wearing these to work and then out for dinner after. Paired with a black turtleneck and white patent leather boots. Looks and fits just like you think it would. 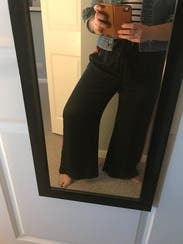 I loved the look of these pants but I feel too short to actually wear them- I'm 5'5". I would've liked to style them with white sneakers and a black bodysuit but they would be dragging by a few inches. Also didn't think they were very flattering on me. I could see them looking amazing on someone tall and very thin. 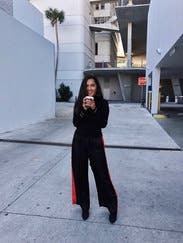 These track pants were so comfortable and pair perfect with a graphic tee and heels! I got a TON of compliments on these. They were a little short on me, but I didn't mind. I kind liked the cropped look. Drawstring makes the fit adjustable. The fabric is nice and comfortable, but wrinkles pretty easily. At 5'2" these skimmed the ground and fit great with platform sneakers. Love these! Got lots of compliments! Rather casual but very comfy. Like dressed up PJ bottoms. Just wore them around the house but with the right outfit on the right person they would be very trendy. I have rather heavy thighs but these were very roomy. Cute for work and going out! 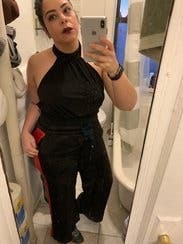 I wore these both to work and to a party and got compliments (I was called sorry spice, my dream!) they were a little big in the waist for me and tight around my thunder thighs but overall fit true to size. Sort of like a boxer's short, in pant version. Really cute pants. Ended up not wearing just because it's not my style. 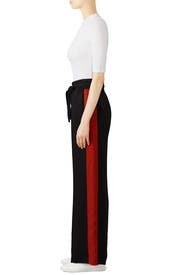 These look pretty cheap and basically like giant track pants in person. There are very few mortals who could wear them and not look like an insane person. 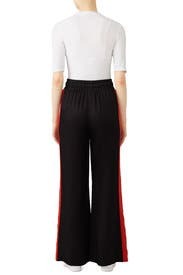 They're kind of weird, but I absolutely love these silk track pants. The cut is very generous at the waist and hips. They wrinkle, but the fabric is so soft and comfortable. I wore them to my casual, very fashionable office and got non-stop compliments. 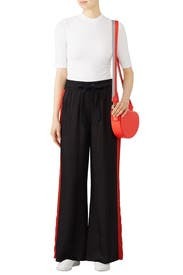 I planned to wear these to work and ordered up a size hoping for extra length because I am 5'10" tall. They were a bit too short for me.